A special friend of mine decided to throw me a surprise Sprinkle to celebrate baby Katia coming soon! She had no idea how much this meant to me, a private event with just a few other very special girlfriends. Walking in her front door I was talking about how I had to pee so bad(Pregnant People Problems!) as I heard chatter towards her kitchen I quickly realized we were not alone. I was overwhelmingly surprised in the best way possible, as I glanced into the dinning room the pink decorations and food put out were all done so beautifully, this was when I put two and two together. This special friend of mine is very talented, she has that unique touch at making something simple look stunning, but my favorite detail of all was the mocktail she had for us that evening. 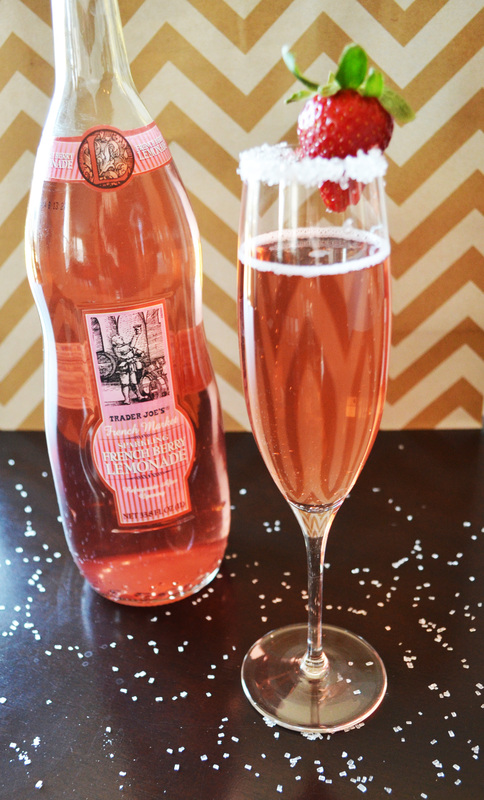 I’m not usually a carbonated drink kind of girl and I don’t like sparkling grape juice either, the only bubbles I like are in my champagne. Seeing as champagne was not the appropriate drink for the evening, she bought Trader Joe’s Sparkling French Berry Lemonade. Let me tell you, it made this preggo feel special where as mocktails usually leave you disappointed and drinking too many in search of the alcohol that doesn’t exist. Remember That not everyone at the party may be drinking and this mocktail is one you can have to make everyone feel special! Highly encouraging you to head to your local Trader Joe’s and give this delicious drink a try!